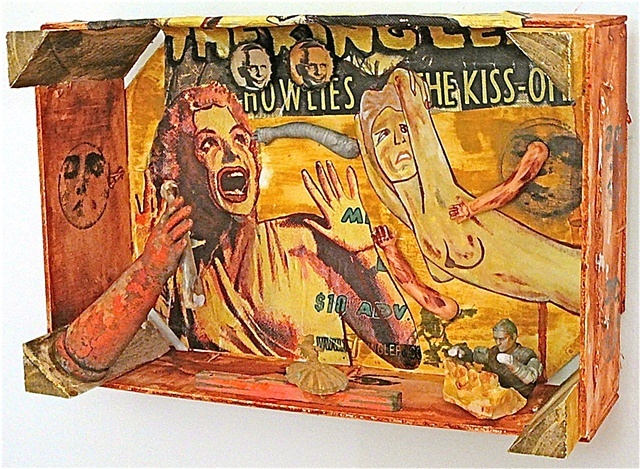 mixed media in wood fruit box: watercolor paint, acrylic metallic paint, collaged paper, doll's hands, dental mold (of my teeth), plastic action figure toy, plastic ballerina, weathered piece of wood, stamps, bone, bottlecaps. 11" x 7 1/2" x 4"
Pretty fantastic work, Jennifer. I love all the arms. what an imagination you have. this work just shouts! great creative, fascinating work you are doing!! What a mix of objects and elements. Very expressive piece. It is privilege to know You. Love it!!!!!!! Can't stop looking at all the amazing little details. A wonderful creation my friend !!! Wow, this looks like an old cinema poster Jennifer. An old movie poster brought dynamically to life. Dass hat ein Vintage look, gefällt mir sehr! Très Original - Bonne soirée ! Excellent work Jennifer , great to see what can be done with a fruit box , paints and a lot of imagination . love it and love the title- we all get that sometimes!!! recent gems! Love your genius & masterful creations! & Thanks so much Collage-Nikov. Best wishes! This is a real winner. withstands the test of time! superb conceptual, greatly composed and with a perfect choice of tones ! Amazing composition , dear Jennifer ! Powerful art, about universal themes (maybe only not for Barbies) which has the impact !!! Oh wow!!!! Absolutely awesome work!!!! Beautiful image ! Lovely composition Very well done Jennifer !! !